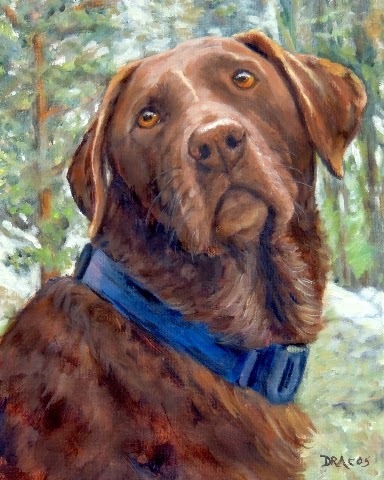 This is a painting of a commissioned chocolate lab I recently finished. She is a beautiful dog, and the photos were well shot, so it was a great pleasure to be able to do the painting. As this was a commissioned painting, the original has sold, but prints are available for purchase in various sizes. We, my daughter and I, found her in a backwoods area in Central Florida when we were out on a walk in an area we probably shouldn't have been. She was underweight, flea-bitten, mangy, and had only three legs. We took care of the first three problems, found no information on why she only had three legs, but she seemed to get along fine without the missing one, and she immediately settled in as the best cat I've ever had. She was proud, noble, no-nonsense, and very affectionate -- but not too much so! She was perfect. Anyway, I decided to name her Matilda for I guess a kind of coarse reason. There's an old song, most popularly known in Australia, called "Waltzing Maltida." Well, Mattie had three out of four legs, and waltzes are in 3/4 time, so -- well, you get the rest. We noticed about a week ago that she was hiding out a lot. Then I noticed that she was thin. Apparently, without my noticing for probably a week or two she had simply stopped eating. The vet could find no cause, only symptoms, which he was unable to reverse -- and all his attempts at saving her were futile. She died very quietly yesterday morning at home in her favorite sleeping place. This is why I keep painting pets who are gone. I only wish I had done one of her while I had a chance. There's an empty spot in my heart today; I'm so very sad. 2013 turned out to be my best year in a very long time professionally, but it left me exhausted! The very short break after Christmas was a very welcome relief. What surprised me most is that my ceramic pieces kept a pretty even pace with my paintings and prints -- and even surpassed them near the end of the month. I'm going to have to figure out a way to make the ceramic artwork be just a little more efficiently done, though, because I'm spending way, way too much time in doing custom work for which I haven't been asking any premium -- they take more than twice as long to do as a piece that I create without custom input from a customer, and they're usually not as much fun to make. So, as soon as I figure out how to do it, I'll be asking a little more for custom work but will be having a lot more pieces available that I've done for the sheer pleasure of making them. Plus, there has been a large interest in the little bowls and dishes I've mostly been making and giving away to relatives and friends, so they'll be for sale as well. So much to figure out!!! Woe to the poor artist/craftsperson who thinks that they can make a product, a great product, and the world will beat a path to their door to buy it -- at a fair price!! There is so much "behind-the-scenes" work to make any of the artwork ever be seen by you, the potential buyer. Sometimes it leaves barely enough time to get my actual artwork done! And that's working seven days a week. Yes, being self-employed, getting to be creative every single day, is a very rewarding way to make a living -- but it's a whole lot more work than anyone working for someone else can possibly imagine. Keeps me young, though! And fresh! My ideas come much faster than I can possibly bring them to reality. My plans for moving/going (can't decide, so I'll take it one step at a time) to La France are still in progress, and I'm just thrilled with how rapidly my ability to speak fluent French is becoming a reality. Will I ever speak as a native Frenchwoman? No way. Think of all the jillions of expressions, memories, shared cultural info, trivia, etc., that are a part of an English-speaking American's vocabulary -- that we've been absorbing since we first started to speak, and that can give you an idea of what one is up against in trying to learn as fluently as possible another language/culture, etc. My son-in-law is from Denmark; and if you were to hear him speak for a while, you would have no idea that his native language wasn't English -- until he comes to one of our common idiomatic expressions based in probably centuries of history -- then he stumbles and comes out with some statement that doesn't quite mesh with a native speaker's way of speaking. The only one I can think of now isn't a very good one: when we state "knock on wood," we all know exactly what it means. He's got a pretty good idea now, but it's still really odd to him and doesn't "trip off the tongue" as easily for him as it would for a native American English speaker. Okay, back to work. Happy New Year again to all, and Peace on Earth to all the world.